Korea's demilitarized zone has become an amazing accidental nature preserve that gives hope for a brighter future for a divided land. This unique picture book invites young readers into the natural beauty of the DMZ, where salmon, spotted seals, and mountain goats freely follow the seasons and raise their families in this 2.5-mile-wide, 150-mile-long corridor where no human may tread. But the vivid seasonal flora and fauna are framed by ever-present rusty razor wire, warning signs, and locked gates--and regularly interrupted by military exercises that continue decades after a 1953 ceasefire in the Korean War established the DMZ. Creator Uk-Bae Lee's lively paintings juxtapose these realities, planting in children the dream of a peaceful world without war and barriers, where separated families meet again and live together happily in harmony with their environment. Lee shows the DMZ through the eyes of a grandfather who returns each year to look out over his beloved former lands, waiting for the day when he can return. In a surprise foldout panorama at the end of the book the grandfather, tired of waiting, dreams of taking his grandson by the hand, flinging back the locked gates, and walking again on the land he loves to find his long-lost friends. 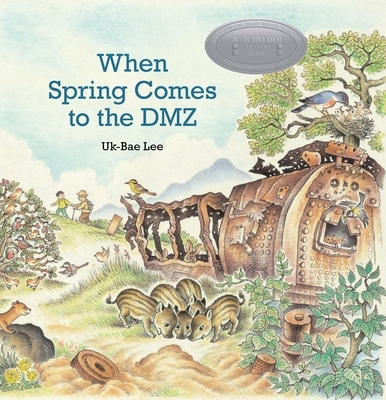 When Spring Comes to the DMZhelps introduce children to the unfinished history of the Korean Peninsula playing out on the nightly news, and may well spark discussions about other walls, from Texas to Gaza.